Elina Autio’s (born1985) installation consists of tubing running along the walls of a room. It applies the standard sizes of pipes and tubes familiar from buildings and follows the orderliness of installed tubing. The orientation of the corrugated cardboard tubes is logically arranged with metal fasteners. The artist employs a feature familiar from buildings as an element of linear composition. 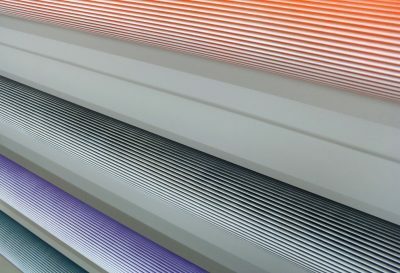 In the installation, paintings are first curved into rolls that become tubes. The tradition of painting provides Autio with a central point of departure for creating her works. 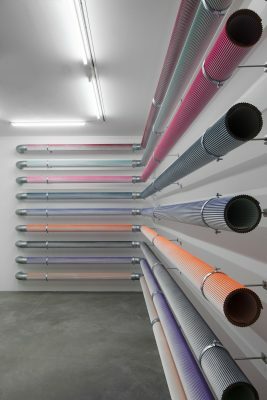 The array of tubes forms a set of stripes on the white wall surface, resembling a constructivist composition in its systematic nature. With her use of colour, however, the artist creates exception to the structural regularity of the piece. The playful use of colour and the pastel hues have no connection with reality, nor do they follow any predetermined system. The surface of the works is painted in a manner that creates a kinetic effect, making them appear to be almost immaterial, and the piece, made of industrially manufactured materials, is finally separated from the everyday level. Elina Autio has studied painting at the Finnish Academy of Fine Arts since 2007 and is currently completing her Master of Fine Arts degree. The Finnish Cultural Foundation has provided support for the exhibition.